STOP BY MY NEW DOG BLOG! Read my fun posts about dogs. Baffled over getting and raising a puppy? Take my Puppy Parenting Course! You'll learn everything from dog breeds and choosing one that's right for you, to caring for a puppy through all its stages of growth, and much more. Choosing a puppy for you or your family involves more than you might think. Did you know... that your puppy's personality will affect and even determine your training methods and how well you bond with your new puppy friend? figure out your puppy's personality? I've just written the booklet, "Unveiling the Myths & Mysteries of Owning A Puppy" that explains exactly how to do that. I'm making it available as a complementary gift to fellow dog lovers like you. Are you having problems training your dog? Or are you just trying to figure it all out? If so, here are some things you need to know. Dog Obedience Training can be somewhat complicated. As you know, the dog and the owner speak different languages. It's up to us to figure out how to bridge that gap. It's not unlike teaching a child. At first, they don't understand the language either, but they quickly learn by watching, listening and deducting. Like children, dogs take what we say very specifically. I'm reminded of those comedic 'aliens visit earth' scenarios where they study our speech and interpret the meaning exactly as the dictionary explains them. The sitcom, "Third Rock From The Sun" is a perfect example. They often don't understand the intricacies of the language, like words that sound the same but have different meanings, or the slang usage most of us have become accustomed to using. The result can be quite hilarious. When training a dog, however, it's not quite so funny when he or she gets the message wrong and just won't obey. We might tend to think the dog is 'disobedient', but that implies a conscious effort to disobey, which often is not the case. If a dog disobeys, it's most likely for a specific reason, like fear or a misunderstanding. In training my own dogs, I'd often use conflicting demands, not realizing what I'd said, until one day I was watching one of those dog training shows. Suddenly, I realized my error when I stepped outside and called my dog to stop some bad behavior. "Kobe, Come here!" I yelled. After several tries, I finally got his attention. When he arrived at my feet, my first response was, "Bad dog. Why didn't you come?" You can see the conflict here. For one thing, I was calling him, but by scolding him when he arrived, I sent the message that he was bad for coming to me. Notice that I used 'bad' and 'come' in the same command. Training attempts such as this confuse the dog and, in the end, lengthen or hinder the training process. In another instance, I caught myself instructing him thus: "Go get your toy, come on, go get your toy." Obviously, this command is much too complicated for a dog to comprehend and obey, especially since I'm telling him to 'come' and 'go' in the same sentence. Often, these quirks of language are too subtle for us to notice, but dogs certainly do. You might be doing the same thing in your dog obedience training efforts. It's quite common for dog owners to make mistakes like this. In most of my 60 years, I've had a dog. You'd think after all that experience I'd know better, but clearly I didn't. Even today, I catch myself sending the dog double messages. When that happens, he just stands there and looks at me, waiting for the correct command. A few sentences later, I get it right. Dogs make good teachers, it seems. If you're having dog obedience training problems, whether it's a new puppy or an older pet, it's not too late. They can be trained at any age, despite the old saying, "you can't teach an old dog new tricks." Fact of the matter is, you can. Quite successfully. In my youth, I studied my dog a lot and often found her facial expressions absolutely hilarious. My mother, unfortunately, didn't see the humor. Our cocker spaniel had a way of reshaping her eyes so they were somewhat pointed at the top and rounded at the bottom. To me, her quizzical expression meant she was wondering what game I had up my sleeve. Anyone who's spent time playing with their dog will recognize the signs that he or she wants to play. A toy placed at your feet, or a wagging tail are pretty good indications. The common believe is that a wagging tail means the dog is friendly and playful, but I've learned otherwise. My current dog wags her tail a lot because she is friendly and playful, but when she's intimidated by strangers or loud noises, it hugs her behind and she presses up against my legs for protection. In this state, a dog could express the fear by attacking as my other dog, Kobe, does. He seldom wags his tail. He's more aggressive, so it's usually tense and curled up in its natural position over his back. I use different techniques to understand him, such as his violent growling. I now know at what point he's actually angry enough to bite, but growling is his way of communicating, even when he's pleased. These are just some of the signs we use to learn a dog's state of mind, but did you know that a wagging tail does not always mean a dog is friendly or playful? As a matter of fact, if a dog's tail is high up and wagging, it could indicate aggression. Unfortunately, many people don't understand this and approach such a dog, arm outstretched, only to get bitten. It's imperative that children learn how to read a dog, even if they don't have one of their own. By understanding the basics, being attacked is much less likely. One of the first things I learned as a child was to never run from an aggressive dog. I was taught to freeze, don't move, wait, and continue on only when it's safe to do so. I've never been bitten by a strange dog, although several have shown aggression toward me. I'll never forget one incident when this training worked fantastic. I was about 10 at the time, walking down the sidewalk when a small dog came tearing off a verandah, barking as though he'd rip my leg off. He did scare me, I admit, but knowing what to do helped me to stay calm and ward of an attack. I stopped in my tracks and froze. To my surprise, he stopped too, just a few feet from me. He continued barking for awhile, but soon slowed to intermittent barks. All the while, I spoke quietly to him, calling him a good dog and that I wasn't going to hurt him. When I froze, he seemed confused and probably wondered why I wasn't running. He just looked at me seemingly confused, and barked. It's important, at this stage, not to look or stare at the dog as this is viewed as aggression. Eventually, he stopped barking and slowly headed back to his porch. He kept turning and barking now and then, probably to tell me to get out of there. He felt he'd done his job. Slowly and cautiously, I began to take a few steps. From his porch, he just watched and barked at me as I moved past his house in a non-threatening way. This move is extremely important for everyone to understand. One time, while I was letting my dog run loose at the park, a woman passed by carrying a rather large handbag on a long strap. It was swaying gently beside her as she walked. My dog began circling and closing in on her. Ignoring my calls, he went after her bag, probably thinking it was another animal on a leash. Instead of freezing or dropping the bag, she began swirling the bag at my dog, making him increasingly aggressive. I eventually got him under control and she moved on, unhurt, although I know he scared her. Thereafter, I always kept him on his leash, thankful he didn't get the opportunity to bite her. Running, kicking, swatting, waving or throwing things or any other aggressive behavior will trigger a dog's natural instincts. It's best to do as I did anytime a dog approaches, aggressively or otherwise. If a dog physically jumps up on you in an attack, try to stay calm. As he jumps, bring your knee up as hard as you can and hit him in the chest. This surprises the dog because he doesn't see it coming. And because he doesn't know what hit him, it doesn't trigger more aggression. After he's down, go into the freeze mode until he calms or retreats, or his owner controls him, and then slowly try to move away. Does your dog challenge you? 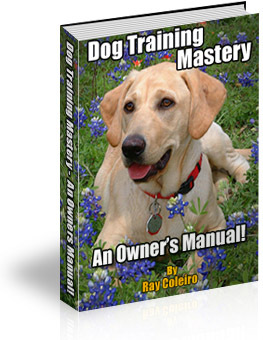 This 55-page manual will give you the answers to your dog's nuisance behavior. Get more details on positive dog training to stop nuisance behavior. by a professional dog trainer. His advice: get it right the first time so you save time and effort training your new or adult dog. Works on all breeds. Click above to read the review. I just came across an instruction book that teaches the right way to train a dog to get fast, long-lasting and effective results. If I'd had this book years ago, my life would have been much less complicated and certainly less stressful. Having a dog that just doesn't seem to want to obey, who reverts to old behavior at the drop of a hat, can make life with a dog barely worth the trouble. If you train your dog correctly in the beginning, regression to old habits are minimized and the actual training time can be cut significantly. When I was a kid, we had an exceptionally well-trained cocker spaniel. Her replacement was nothing like our Jeannie, who was very intelligent and quick. The newcomer was far more playful and like an overactive child, she didn't seem to have the 'patience' to sit still long enough to learn anything. After several months, the dog went back to the seller. This happens frequently when families find that trying to train their dog seems too difficult. They think it's taking too long or that the dog is untrainable. Just when they think they're making headway, the dog reverts to old behavior and seems to forget everything he or she had learned. I've discovered an excellent training manual that certainly has taught me a few things. Written by a professional dog trainer, this dog obedience training book, Sit Stay Fetch, covers everything you'll ever want to know about training your dog, young or old. Unlike many other manuals, this one includes photographs of the steps you need to take to perform each training exercise. It also covers other things you need to know, from feeding to choosing a veterinarian. And if you still have problems after following the steps in the manual, you can contact the author directly for feedback on your specific issue.. 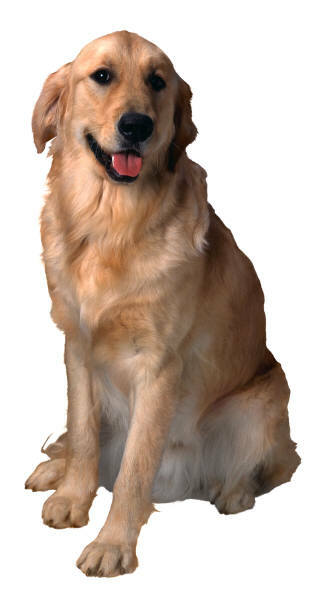 The Sit Stay Fetch package also includes several other useful manuals on specific topics related to dog ownership. To read the full review. Discover the nutritional secrets that can make the difference in your dog's overall health. 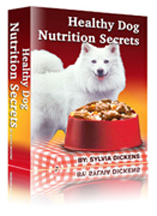 My Healthy Dog Nutrition Secrets package explains all about the dangers certain foods pose for your dog, includes delicious home- made dog food recipes, dog care advice, puppy training and more. Click for details. express written consent from the site owner. prosecuted to the extend allowable by law.